New Iran revolution is going to topple the clerical regime. 40 years ago in such days, the people of Iran marked the greatest change in the history of their homeland in the 20th century; Iran revolution, the outcome of a hundred years of struggle for freedom, independence, and justice. Unfortunately, they couldn’t achieve their goals because Khomeini betrayed them. But the wish of people for a secular, democratic Iran never ended. And as such, we are witnessing more and more protests and uprisings in Iran, nationwide. In this article we intend to shed light on the true aspects of Iran revolution. One of the most important era in Iran’s history in the last hundred years, was the secular government of Dr. Mohammad Mosadeq. Having the support of the people of Iran he was able to nationalize Iran’s oil industry. But on August 19, 1953, the Shah, with the help of Mullah Kashani, Khomeini’s true forefather, held a coup d’etat against Dr. Mosadeq’s government. In this way the only popular government in Iran’s history was overthrown. This coup d’etat paved the way for the emergence of Khomeini in the years that followed. The Shah established SAVAK and advanced a brutal suppression to plunge the society in despair. But the pioneers of Iran revolution, tolerating torture, execution and long term imprisonment, implanted the seed of hope for liberty right within the heart of the society. Due to the unprecedented perseverance of struggling organizations such as MEK/PMOI, the people took into the streets and eventually on February 11, 1979, the monarchic dictatorship was gone forever. As the uprisings and protests surged in 1978, Khomeini didn’t hesitate to station himself in France, despite living for years in Iraq. Misusing the desire of Iranians for freedom, he claimed to be the leader of the revolution in the absence of its true leaders who were then in chain at Shah’s prisons. Khomeini, making a deal with the western appeasers was able to usurp the leadership of Iran revolution. Unfortunately, this policy of appeasement which has last for 40 years has resulted in the survival of the number one state-sponsor of terrorism in the world; the primary victims of which are the people of Iran. In this manner, Iran revolution not only didn’t reach its goal of freedom, but it also led to a callous theocratic dictatorship. The 40-year dossier of these fundamentalist rulers is full of betrayals, devastations, misery and darkness. The water crisis; ruined environment; polluted air; the problem of aerosols; the dire condition of the roads; suicide of the youths; unemployment; the spread of poverty, addiction and prostitution; and presold mines and resources and even the soil of Iran, are only a small part of this destruction. The catastrophe does not end there. Khomeini’s dream of Islamic Imperialism exports the threat of fundamentalism over Iran’s borders. His persistence on continuing the Iran-Iraq war with millions casualty and thousands cities and villages destroyed, for eight years, is just one example of it. And this wasn’t the whole story. To reach his goal Khomeini established organs like IRGC. Warmongering and export of terrorism turned to an inseparable congenital aspect of this regime. For that reason, expecting that someday, there would be an end to the devastating presence of this regime in the region is just a mirage. Without trying for expansion, the main state-sponsor of terrorism cannot survive. Even its quest to achieve atomic bomb is because of that. And thus, announcing that it has put his atomic project aside, as it has recently been revealed, was nothing but a sophistry. In spite of an unleashed suppression, the Iranian people and their resistance never stopped fighting this regime. 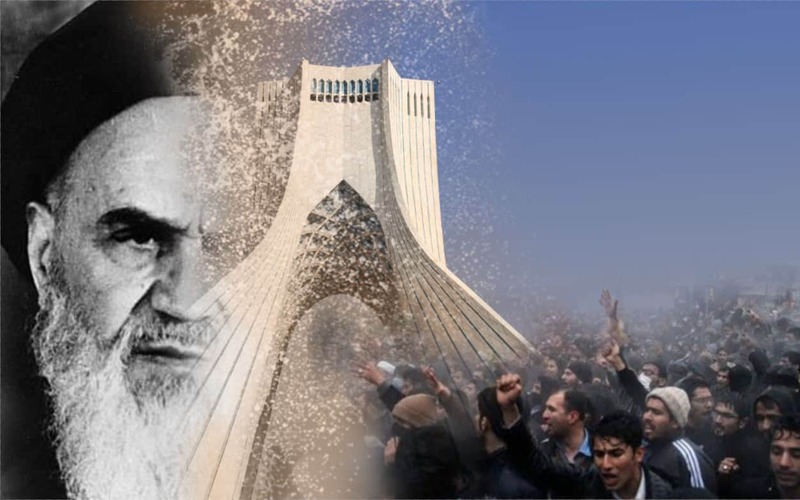 Since 1979 there hasn’t been a year that the mullahs didn’t fear the danger of being overthrown by the people and their resistance looming on them. Unfortunately in all these years the west has gone blind on the right of the Iranian people to achieve their freedom. They bombed and disarmed the main Iranian force that could encounter this regime and overthrow it. If the west had stood with this force of freedom it could have rid itself of fundamentalism and terrorism enrooting in this regime, more than a decade ago. “Neda (the most prominent martyr of 2009 uprising) was killed but with open eyes, while we had closed ours”. The reason, of course, is the existence of a powerful and popular organization, the MEK/PMOI which Khomeini has named as “the arch-enemy”, and a coalition of freedom-loving forces, the National Council of Resistance of Iran (NCRI) which has lasted for 37 years. In reality, the MEK/PMOI is the true face of Iran revolution with more than 120,000 of its members and supporters fallen for freedom. In just one summer (1988), 30,000 of them were hanged in what has become known in history as the “massacre of 1988”. MEK/PMOI was the force that made the regime to accept a cease-fire in Iran-Iraq war, making Khomeini drink ‘the chalice of poison’ as he put it himself. The NCRI with the help of the MEK/PMOI network’s information from inside the country, revealed some one hundred cases regarding the regime intention for achieving atomic bomb. The members of this organization have been the target of 150 terror operations by mullahs’ terror squads in different countries of the world. Only in 2018, three of these terror plots were foiled leading to an international crisis for the regime. A real Iran revolution is coming! Through their vast internal network; the Resistance Units, the MEK/PMOI has made the regime desperate. The activities of these units are the determining factor in overthrowing the religious fascism ruling Iran. They are those who guarantee the achievement of a hundred years old goal: the Freedom. This goal is truly achievable. There exists a democratic alternative. Its plan for Iran’s future is represented by Mrs. Maryam Rajavi, the president-elect of the Iranian resistance. The overthrow of the world’s foremost state-sponsor of terrorism is at hand, more than ever. The Iranian people and their resistance expect the west to recognize their struggle for freedom at the Warsaw Summit and take the right side of the history. Regime’s oppressive organs and its organs of warmongering and export of terrorism such as MOIS and IRGC must be blacklisted. Its nests of spies, its embassies abroad must be shut down and its terrorist diplomats must be expelled. I believe that the uprising of the Iranian people will be victorious, because it is led by a resisting organization called the National Council of Resistance of Iran led by Mrs. Maryam Rajavi.